CompTIA Breakaway 2012 has attracted several hundred VARs and MSPs this week in Las Vegas. So what's the chatter here in the halls? Beyond cloud computing, CompTIA is now focused on Big Data and Machine to Machine opportunities for partners, said CEO Todd Thibodeaux. 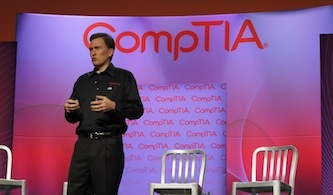 Also, he called on the U.S.
CompTIA Breakaway 2012 has attracted several hundred VARs and MSPs this week in Las Vegas. So what’s the chatter here in the halls? Beyond cloud computing, CompTIA is now focused on Big Data and Machine to Machine opportunities for partners, said CEO Todd Thibodeaux. Also, he called on the U.S. government to reboot the IT health care effort, and to open up more wireless spectrum to drive innovation — using WiFi as an example of success. Here’s the update from our always anonymous and highly opinionated blogger. 1. Quest Software-PacketTrap MSP: As you may recall, Dell recently won the bidding war for Quest Software, which owns PacketTrap — the managed services software provider. Instead of getting distracted by the deal, the PacketTrap team continues is heads-down on a few things. The company’s PacketTrap PSA software has been well-received in the cloud, The VAR Guy hears. Plus, PacketTrap MSP will have a SaaS version down the road. 3. Carbonite: The cloud backup provider launched a channel partner program about a month ago. During a demo in the booth, Carbonite showed how channel partners can control end-customer pricing for cloud storage. Plus, the cloud user interface allows partners to manage all customer engagements from a single dashboard. 4. Open Source Storage: That’s the big theme from Red Hat North America Channel Chief Roger Egan. The VAR Guy will be sitting down with Egan later today. Egan sees an opportunity for virtualization and storage to converge in the cloud, with Red Hat partners leading the charge. 5. Channel Eyes Going Mobile: Channel Eyes founders Bob Godgart and Jay McBain are making the rounds here. The social media network for channel partners apparently is making a mobile push here. But The VAR Guy has yet to catch up with Godgart and McBain, both of whom are huddling in lots of meeting here. 7. Veteran Hiring: Continuum has announced a major push to help ensure returning U.S. veterans have jobs to come home to. Details soon on MSPmentor, The VAR Guy’s sister site. Hats off to Continuum, CompTIA and other organizations that are working on veteran-focused hiring efforts. 8. Big Themes: During an opening keynote, Thibodeaux asked if Cloud Computing had “jumped the shark” or reached a true tipping point for partners? Also, he mentioned Big Data and Machine to Machine (M2M) as the big trends going forward. Stay tuned. Live coverage of CompTIA Breakaway continues. Rumor has it a 14-year-old IT wonderkid will be on stage soon.